Timothy was born November 24, 1949, in Hartford Conn., to the late Caroline Kinloch Bull Grannis of Georgetown, S.C. and the late Peter Edwards Grannis of Greenwich, Conn. 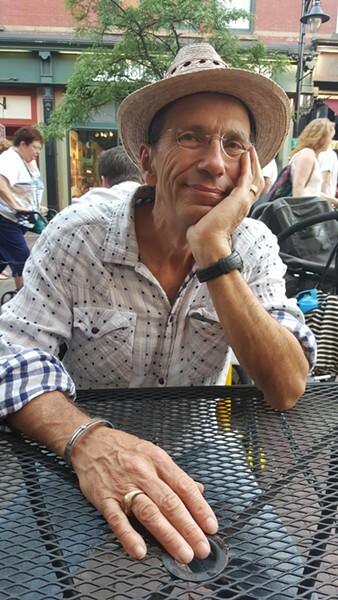 He died on September 6, 2016, in Burlington, surrounded by his friends and family, after declining rapidly over this past year with early onset Alzheimer's. Timothy is survived by his partner in business and in life, his loving wife, Susan Elizabeth Hurd. He is also survived by his daughter, Genevieve Chesna Grannis Hathaway, and her husband, Keith Hathaway; his daughter, Rebecca Eve Grannis, and her husband, Chapin Spencer; his stepson Will Idaho Hurd, and his wife, Biyokuri Bidameri. He leaves behind his grandchildren Kaylan Hathaway, Jarrit Hathaway, Zia Clara Grannis and Asa Ray Hurd. Timothy is survived by his loving brothers and sister, and their spouses: Yissacher Granitsky (fka Peter Edwards Grannis Jr.) and his wife Esther Granitsky; Anne Cleland Grannis and her husband Lee Stephen Engdahl; Stephen Bull Grannis and his wife Christina Lynn Grannis. He is also survived by many beloved nieces and nephews. Timothy led a vibrant life, full of creativity, humor and mischief. He enjoyed a childhood filled with adventure, fireworks and family. When he was 12 years old, he began making jewelry with his father; this endeavor sparked a creative passion that would shape Timothy's life's work as a metalsmith. Timothy graduated from Watkinson School in Hartford, Conn., winning first prize for his senior art project. During his two years at St. Lawrence University, he cultivated a community of radical friends, fought the system and made art. Timothy and his first wife, Victoria Graf, settled in Vermont in 1972, where they raised their two daughters. Timothy completed his degree at the University of Vermont and opened his first jewelry studio in Underhill, which he later moved to Essex in 1982. Through his studies with Heikki Seppa, a renowned Finnish metalsmith, he learned the art of anti-clastic forging. He was able to further develop his three-dimensional metal work through a grant he earned from the National Endowment for the Arts. He was also honored to be selected for a special exhibition of artists at the mansion of the vice president of the United States. Timothy's artist statement read, “All the elements of my work and life distill down to this statement: 'I just like to make stuff. '” In 1998 Timothy and his life partner, Susan Hurd, opened the Grannis Gallery in Burlington as a venue to showcase Timothy's “stuff” and as a realization of their dream of creating and selling unique collections of designer jewelry. Together, they crafted a creative and successful business, earning the readers' choice award from Seven Days for nine years, as well as JCK's Top 10 Designer Jewelry Stores award. Timothy and Susan married in 1999. Ten years later, they closed the Grannis Gallery and opened Alchemy Jewelry Arts, a small artisan collective in the South End Arts District of Burlington. Together, they continued to bring beauty to the community with Timothy's inspired creations. A celebration of Timothy's life will be held on September 25, 2016, at 5 p.m. at the All Souls Interfaith Gathering in Shelburne. A private reception will follow. For those wishing to honor Timothy's memory, please take a moment to give love to your family and friends and do something to make the world more beautiful.